Alderney was first inhabited 2000 years before the arrival of the Romans. However the oldest surviving reference to the island is in the Charter of 1042. When William the Conquerer become King in 1066 Alderney was attached to the English Crown for the first time. Due to the island’s position in the English Channel it has always been an area of strategic importance. The many fortifications on the island have been built by various occupying forces over the centuries. During the reign of Henry VIII war broke out between England and France and work commenced on a strong defensive fortification – Fort Essex – which can still be seen today. In 1793 with the outbreak of the French Revolutionary Wars, and a general feeling of instability, the British government sent 300 men to Alderney and they built Fort Doyle. 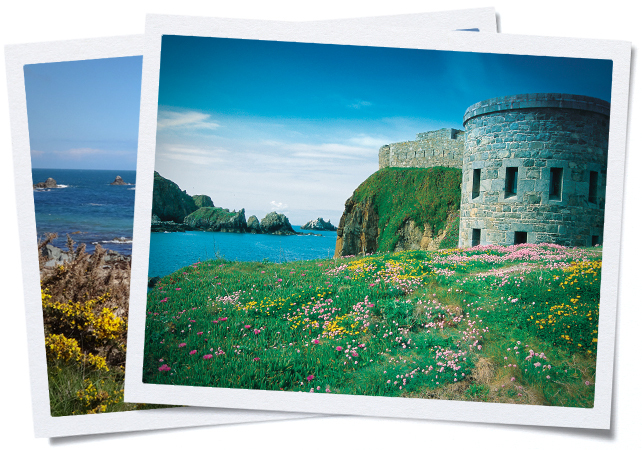 A little later, in 1811, the Telegraph Tower was built to establish communication with Guernsey and Jersey. Locals have always been at the mercy of those who want to use the island to defend their own territories. Fortification started in earnest in the 1850’s when the British Admirality felt threatened by the strong French naval base at Cherbourg. At this point the Braye breakwater was constructed to create ‘a harbour of refuge and observation’. Ten large forts were also built by an imported labour force, and these impressive structures can still be seen today. The other evidence of military defence visible all over the island are the many bunkers. The Germans built these during World War Two, using Russian and French Jewish slave labour. The aim was to turn the island into one large fortress, with gun emplacements, defensive works, underground shelters and a network of tunnels. Alderney residents were evacuated at this occupied time but returned at the end of the war to find houses damaged, possessions gone, the breakwater in disrepair and the island itself looking a very different place. The British government provided aid for the islanders to rebuild their homes, and also took the opportunity to instigate radical reforms in Alderney, resulting in the adoption of the Government of Alderney Law of 1948, that still regulates the island to this day. The island is part of the Bailiwick of Guernsey and has all the tax advantages of it Channel Island neighbours, however Alderney does not have the restrictive residency qualifications requirements of Guernsey and Jersey. Non-locals are able to buy houses and take advantage of the lower tax and inheritance laws.